Manager Phil Reeve had made two changes from his original team selection, replacing Sam Gamble with Danny Walker, as skip of the young rink from the Under 25s, and replacing Callum Height as skip with Alan Ashby on another rink, due to Height being unwell. The match started well for the County and after five ends they were 13 shots ahead. The next five ends saw the lead more than double to 29 shots at 68-39, and five ends later, so great was the dominance by the County, the advantage was 61 shots. Lincolnshire did stem the rate of their deficit over the final six ends, but still had to suffer a defeat by 70 shots. The County had five winning rinks and one drawn, so just missed out on the achievement of last week when a maximum tally of points was achieved. The highest scoring rink for the County was that skipped by Jamie Walker, which posted a massive 29 shots victory. NORTHANTS Ladies took on Warwickshire in a Middle England League match at Wellingborough BC and secured a 116-104 victory. With three winning rinks and three losing, the County picked up an 11 points tally to the six of their opponents. The highest scoring of the County’s rinks was that skipped by Rebecca Wigfield, which posted a 15 shots victory. The match was pretty even for most of its duration, with Warwickshire having a few shots advantage after five ends, and again after 10 ends. The County ladies went in front by a few shots after 15 ends, but relinquished that lead to go behind by five with three ends to play. 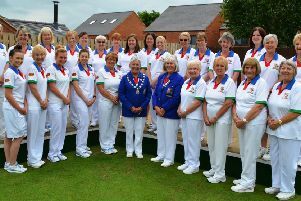 TEAM boss Jan Hunt has selected her team to represent Northants Ladies in the premier women’s inter-county competition, the Johns Trophy against Bedfordshire this Saturday (June 2). The match is being staged at Wellingborough BC, starting at 1.30pm. NORTHANTS Men took on Cambridgeshire in a five-rink friendly at Burton Latimer, and suffered a 107-94 defeat. Cambridgeshire borrowed several Northants players though, including John Chester, Richard Somerton and Margaret Tyler, and two of those were on the highest winning rink for Cambridgeshire. So the County might feel that it was not such a loss! Northants did have two winning rinks, the highest being that skipped by Geoff Hunt, which recorded a three shots victory, but not far behind was the other winning rink, skipped by John Church which posted one shot fewer. TEAM boss Phil Reeve has named his team for the Middleton Cup match against Hertfordshire at Kingsthorpe BC this Saturday (June 2, 2pm). The team features players winning their Middleton Cup flash, including Chris Gray of Burton Latimer Town BC, Mick Spear of Kingsthorpe BC and Shaun Marriott of Northampton West End BC. 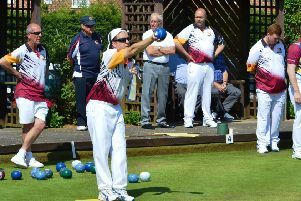 THE annual Northants Men versus Northants Ladies challenge match was staged at Wellingborough BC, and this year the bragging rights go to the men’s team who secured a big 106-68 victory. Northants Men won four of the five rinks, losing the other one, and the highest scoring of the men’s rinks was that skipped by George Warren, which posted a 17 shots victory. The Women’s winning rink was skipped by Brenda Bishop, and it recorded a five shots win.